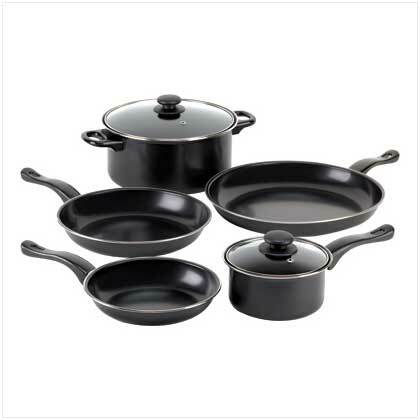 The Graphite Black 7-Piece Nonstick Iron Cookware Set is a chef's set that adds basic pans and a skillet to a kitchen set up. This iron pots and pans cookware set is good for a beginner or for one who is setting up a first apartment. Use utensils that will not scratch the cooking surface. Iron construction Is durable and dependable. Wears well. Non stick interior surface Makes cooking easier and clean up a breeze. Curved handles Fit the hand comfortably, are heat insulated and remain cool to the touch. Black color Is attractive and looks sharp in today's designer kitchens.